Takada House (旧加賀藩士高田家跡) is the ruins of Takada family who were the samurai of Kaga Domain. Takada was Samurai with 550 koku which is very high-class of Samurai in Edo period. There is restored gate from a tenement houses and remaining garden of Takada House. Takada family was in a social class that had from 80 to 2400 koku of rice, and this is literally the style of house of those in the middle class at that time. In the Nagamachi area, many families lived in this style of house. 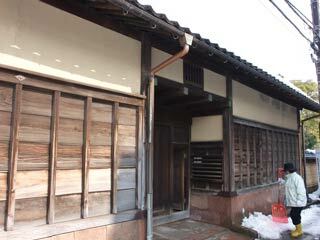 The style of Samurai houses are different according to the mud walls and the style of gates. The gate of Takada House is a typical "Tenement-style gate." Members of the feudal era middle class, like the Takada family, were permitted to make stone cellars, at the foundation of the tenement house, which were important to the Kaga leaders. Because, in general, the highest leaders in this class owned and rode horses, to the left side of this gate was a stable and to the right was footman's room, or the residence of the servants, called the footmen or little people. The footman lived in the nakama room lived and worked n the same room. WHile he worked, he often was able to make Japanese Sandals as a part-time job to earn pocket money. Here there is an explanation of these servants' social position, clothes and daily duties. Samurai with over 400 koku were permitted to built stables, where the horses would be raised when the head of the house was way. The display room of this stable introduces the situation of the servants that took care of the horses and it also explains about the life, social position and organization of the middle class samurai. In the feudal era, large Samurai houses were built on sites of 1450 square meters. What remains today is about 891 square meters. On this site, the military gardens take in water from the Ohno sho canal.